I grew up a few miles away from Donald Trump in Queens, N.Y. So I knew how you were supposed to mark our nation’s Independence Day: By getting illegal fireworks from Chinatown. Then shooting them off in crowded neighborhoods until they sounded like Mosul, Iraq. The Italian and Irish kids would spend their savings on “blockbusters” (1/4 stick of dynamite, we were told) or M-80 rockets and use them to stage impromptu mortar fights in Astoria Park. I came out of childhood with all my fingers intact. Now I am older and wiser. Mayor Giuliani cracked down on illegal fireworks. And I no longer live in New York. 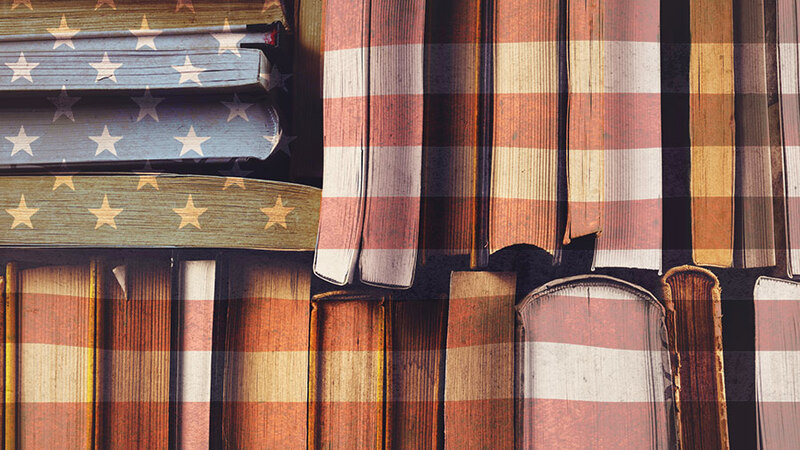 So I’ve decided to mark the day of our nation’s birth more sedately: By recommending the best recent books I know of that explore our nation’s heritage. Not one of those Founders, not even Deists like Thomas Jefferson and Benjamin Franklin, believed that American freedom could survive without the moral code undergirded by widespread Christian faith. 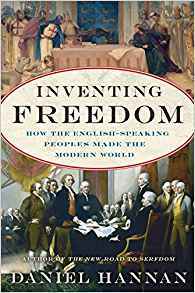 Inventing Freedom, by Daniel Hannan. A rich and readable book by a British member of the European parliament — and a leader in the Brexit movement. It’s too good to miss. It traces the freedoms which citizens enjoy in nations settled (or in some cases, colonized) by Britain. These go back not to Greek or Roman philosophy, Hannan argues. No, they trace more directly to the customs of the Anglo-Saxons. These Germanic barbarians conquered and settled in Britain after the last Roman legions departed in the fifth century. They replaced the Roman government with tribal rule. They brought with them a love for voting and a deep distrust of tyranny. the presumption of legal innocence. It is no accident that nations with deep British influence are among the freest, fairest, most prosperous spots on earth. My favorite incident in the book, which I edited for publication, is this one: When the Catholics of Maryland needed a new bishop, the Vatican wrote to the newly established U.S. Congress, asking for its permission. Those Protestant legislators were puzzled. Citing the First Amendment, they wrote the Vatican back: It was free to do as it liked. That answer puzzled the pope, and deeply impressed him: In all the Catholic monarchies of Europe, the kings wielded veto power over such basic church decisions. In the new American government, the church was free to flourish. As it did, for two hundred years. Metaxas confronts the myth that the U.S. was founded on secular, Enlightenment principles. 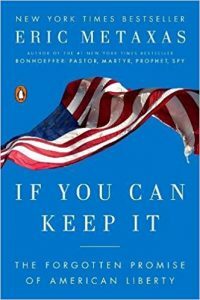 If You Can Keep It, by Eric Metaxas. This 2016 book by the popular apologist for the Gospel and radio host goes to the basics. Metaxas confronts the myth that the U.S. was founded on secular, Enlightenment principles. (Like those that goaded the bloody, cruel Revolution in France.) That assertion was long the fodder of cranky village atheists. But it has lately been given legs by a strange new faction of “illiberal Christians.” These include Catholic professors like Patrick Deneen and Michael Hanby. Rod Dreher has popularized them (and cited them extensively) in his writings on the Benedict Option. Metaxas points to the mountains of evidence in the writings and speeches of our Founders that prove the contrary. Not one of those Founders, not even Deists like Thomas Jefferson and Benjamin Franklin, believed that American freedom was incompatible with Christian faith. In fact, none of them thought that such freedom could survive without the moral code undergirded by such faith. Metaxas shows the organic connection between the Declaration of Independence and centuries of British, Christian struggles for religious and civic freedom. Think of Metaxas’ book as the Protestant counterpart to Tea Party Catholic. Read these three books together to appreciate the medieval, historical, and ecumenical Christian backgrounds to American freedom. We should see our freedom as fragile, precious, and one hundred percent dependent on the survival of the culture that gave it birth: A culture that values human rights because it sees human beings as precious — as images of God whom He saw fit to create, redeem, and sanctify. No tyrant has any right, no ideologue any claim, to degrade or oppress God’s noblest creature. 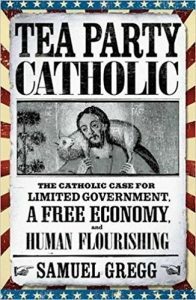 John Zmirak is author, most recently, of The Politically Incorrect Guide to Catholicism. Thanks! Having little appetite for the more festive aspects of today – life getting in the way – I will take you up on this! Perhaps theres a a future release by Mr Zmirak in the works, ” A Politically Incorrect Guide to Patriotism, Religious Liberty & Other Endangered American institutions” ….? Wonderful suggestions! The last two I have read, cherished, passed on to friends, and bought copies for some Social Justice Warriors. The first one I will retrieve from our county library first thing tomorrow. Thank you, John Z.
I suggest Mark R. Levin’s latest book: REDISCOVERING AMERICANISM AND THE TYRANNY OF PROGRESSIVISM. I am about halfway through it and its is awesome. Why wasn’t t suggested? Excellent book! I finally got around to reading Rebel Yell, a history of Stonewall Jackson. Great book and provides information about the history of the Civil War and Stonewall Jackson, one of the greatest military minds our Nation ever produced.